The Ketogenic Diet and blood sugar, inflammation, blood pressure, and memory? “To Diet or Not to Diet” has become the present-age dilemma. To be fair, it is more about being health-conscious than body image-conscious for the millennials of today. It is no surprise then that the ketogenic diet, or the ‘keto diet’ as it is popularly known, was one of the most searched terms on Google in 2016. A lot of diet fads have come and gone, but it seems like the keto diet is here to stay. Is it good for you? Or does it cause more harm than good? Read on to know more. 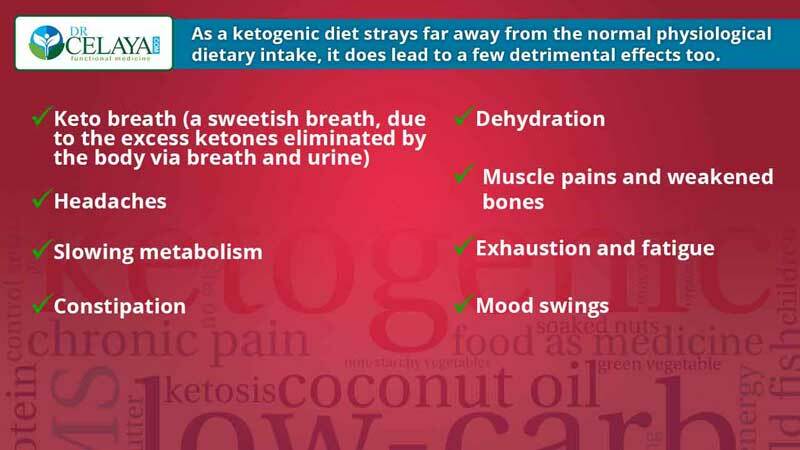 Simply put, a ketogenic diet is a low-carbohydrate, high-fat diet with moderate to low protein intake. The diet aims at putting your body in a state of ketosis by depriving it of carbohydrates (carbs) as a source of energy, which will help burn body fat for energy. Ideally, in a strict, standard ketogenic diet, around 70-75% of your caloric intake should come from fats, and only 5% from carbs, with the rest from proteins. This amounts to having less than 30 grams of carbs daily. However, there are also variants with a higher carb intake, which can be opted for in the beginning. Normally, our body uses glucose from the carbs we eat as energy. Excess carb intake leads to storage of glucose as glycogen in the liver and muscles. After three to four days of a low-carb diet, the body goes into a ‘starvation-like state’ and starts opting for alternative fuel sources. This leads to a production of ketones from fat in the liver (hence, the name ketogenic), which are then used by the organs. In a nutshell, this diet creates an efficient burning of fat in your body to provide you with energy, leading to weight loss. 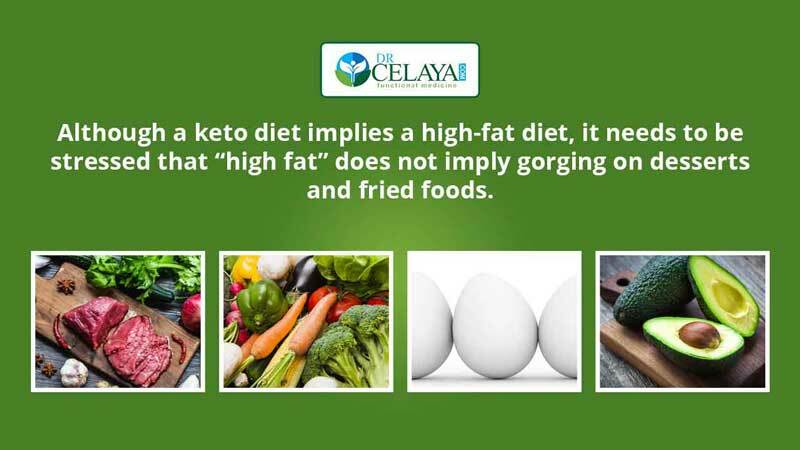 If you would like to know more about how the Keto diet can help your health, you can schedule a free 15-minute consultation with Dr. Celaya. Although this might not go down well with our avid weightlifters, the protein intake has to be kept low, because high protein can lead to increased blood glucose levels and this is not where the diet is aimed. High-fat, low-carb? Uh-huh. Tell me what can I eat! Seems like too much effort for only weight loss? Think again! Lowers risk of Type 2 Diabetes, because of low levels of glucose in the blood. Lowers blood pressure and risk of heart disease – The keto diet helps increase the good HDL cholesterol. Protects against cancer – It is widely believed that cancer cells cannot alter their metabolism to use ketones instead of glucose, and hence, are starved on the keto diet leading to their inability to proliferate. Fights cognitive impairment – There has been a lot of research that suggests a beneficial role of the keto diet in preventing and reversing the decline seen in brain disorders like Alzheimer’s disease and Parkinson’s disease. These effects are more pronounced in the first couple of weeks and might not need cessation of the diet in everyone. Although you manage to lose weight on the keto diet, it does not help in increasing the muscle mass of your body. Moreover, it has been noted that being on this diet also reduces your training performance in the long run. One also has to remember that completely eliminating carbs from your diet is not recommended, as this will lead to deficiencies of essential nutrients. The most serious complication is the possibility of ketoacidosis, due to building up of excess ketones in the body. This could even be fatal. Considering the magnitude of effects a keto diet can have on your body, I would advise you to consult a physician or qualified nutritionist before going ahead with this diet regime. Being cautious never hurts! Lastly, a diet can only succeed in helping you get healthier if you manage to stick to it. 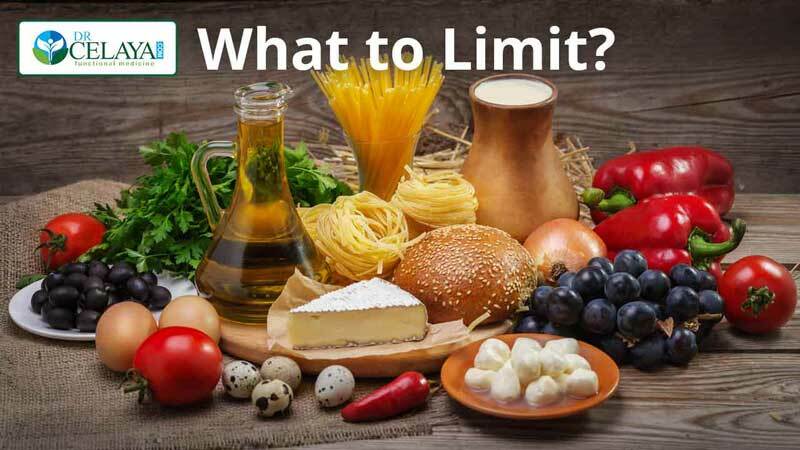 Although the keto diet does not involve you starving yourself, the low carb intake might pose a problem for some in the long run. Balance is the key to good health and one size does not fit all. If you would like to get to the root cause of your health problems, you can schedule for a free consultation with Dr. Celaya.